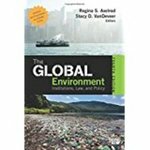 "The Global Environment: Institutions, Law, and Policy, 4th Edition" by Regina Axelrod, Stacy VanDeveer et al. David Downie is a contributing author, "International Environmental Regimes and the Success of Global Ozone Policy." Book Description: The new edition of this award-winning volume reflects the latest events in global environmental politics and sustainable development while providing balanced coverage of the key institutions, environmental issues, treaties, and policies. The volume has been reorganized to better highlight global environmental institutions, major state and non-state actors, and includes an expanded set of cases such as climate change, biodiversity, hazardous chemicals, ozone layer depletion, nuclear energy and resource consumption. Based on reviewer feedback from faculty and students, the new edition broadens coverage of the growing global environmental agenda and explores the relationships between states, NGOs, and international organizations. Axelrod, Regina; VanDeveer, Stacy; and Downie, David Leonard, "The Global Environment: Institutions, Law, and Policy, 4th Edition" (2014). Politics Faculty Book and Media Gallery. 33.